Welcome to CPE! I invite you to look over what is offered here and to take your time exploring the services and information provided as there is potential for your spiritual journey to unfold to a deeper and deeper place. Below you will find my journey story which is winding along and still unfolding. I’m so glad you arrived! I have come to believe that story is important in most everything. It all has a tale to tell from how the button on your blouse came to be just the shape and color it is to how the world began. Each story is vital and has a unique and meaningful place in the whole of our experience of the world. I’m interested in stories because in them is the soul of a thing and the inspiration of it. So, it seemed important to me that telling you a little bit of my story would perhaps be contributory to your visit here and your inquiry of what The Center for Personal Evolution might have to offer you on your journey as you create and unfold your story. As a professional I have had a life time career as an educator. I began teaching in the early 80s in response to my desire to assist children in developing their imaginations and learning to express themselves freely and with verve. From these experiences in my early 20s and 30s I developed summer camps in several places in New England that focused on teaching the arts; both performance and visual. My work expanded into programs for adults in both theatre and the visual arts through continuing education programs and my own classes offered out of my studio at home. Art has been a companion to me throughout my journey in life. It has been a means for self enlightenment and healing. My art has been exhibited, assisted in educating those in the adoption field via lecturing with my art exhibits. I have exhibited an art series on EMDR and traveled to show this work as a means for bringing education and understanding around PTSD and EMDR as a powerful tool for healing and transformation. I invite you to consider creating art and how it has a language and means of communicating with you. Other arts have pepperred my life as a professional. Some of these are: writing, directing theatre productions, acting, costuming and painting. I spent many, many summers as a self taught costume designer where my second career and passion included costume design for The Vineyard Playhouse, Island Theatre Workshop, high school and middle school productions as well as the work of independent directors and my own productions as a director. In my professional career as an educator I worked as a special education teacher with a focus of assisting, supporting, and helping to remediate students challenged with learning disabilities and challenges with emotional and behavioral issues. Over the years working in this field I have realized the importance and helpful impact of having the framework of social work is and so I returned to school to get an additional master’s degree in this area. The work as a special education teacher has offered so much to me as an individual in my own personal growth and has been very satisfying. As I approached my 27th year as an educator I realized it was time for a change. I felt that I had a treasure trove of trinkets, bits & bobs to offer my community outside of the institution of education. My longing to talk about personal growth, self help, spirituality and belong to a community of like minded people grew strongly inside of me. With my bag of tools packed and my heart alighted with new ideas and thoughts for a different future I retired from my job and set out on a new adventure! The pot at the end of my rainbow has become The Center for Personal Evolution. A place for individuals to come and be a part of a community of people looking to grow, share their spiritual journey, and be among others who are like minded. The treasure that has stayed with me the longest, that I teach and offer, is Your Mythic Journey Workshop (aka Telling Your Story Workshop). It is a perfect blend to accompany transformational healing work. I developed this workshop in 2004 and have been teaching it ever since. It is a workshop that was created out of my own personal growth and integrative healing. It has always felt Divinely inspired and it continues to reach people in very deep ways; bringing a sense of self that is more firmly planted, a recognition that there is both light and dark in every experience and that we can choose our story perspectives and thus choose the message we tell ourselves that informs the quality of our internal experience of ourselves, the world and our life. I charge a minimal fee for the workshop because I hope and wish that many people will come and partake in this process for their own opening in their journey and the loving embrace of self that the workshop offers. At the center there is all kinds of fun to have on the road of personal growth and healing. All we need is a window into ourselves. Through transformational healing arts, creating art, meditation, circle gatherings in groups and community activity; we find that road! To build and be a part of a community that is based on healing, personal growth and evolution that, by its very nature and intention, contributes greatly to the whole, to the larger community, the larger sense of things, and to our larger story that is unfolding is exciting and meaningful ways as we walk our path. I invite each of you who are reading this to join me on this path, in this daring, brave and enlightened effort to grow and evolve ourselves and in doing so grow and evolve the consciousness of our planet; of the whole. My shamanic spiritual path began my training in shamanic healing in 1989 with one of the earlier groups of practitioner trainees who studied under the tutelage of Michael Harner, founder of the Foundation for Shamanic Studies. These newly trained teachers then embraced me and I began my study with them. 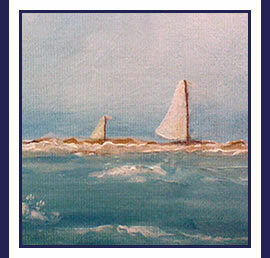 Together we, as a group, deepened our skills in this field of healing for four years on Martha’s Vineyard. I also worked with shaman Foster Perry of Golden Hummingbird Medicine for over 12 years as a means for personal transformation. 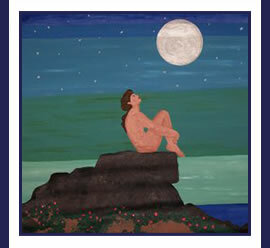 I was called to futher develop and apply my skills as a Shamanic Practitioner in 2010. 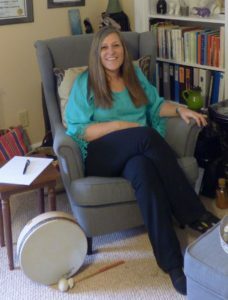 My shamanic studies have included shamanic study of Siberian Shamanism with Steven Serr and Peruvian Shamanism with Chris Krohn to deepen the work in my shamanic practice and to broaden my tools and techniques. What I offer others in the Shamanic perspecitve is multicultural and offers a variety of layers under the umbrella of shamanism. For four years I was fortunate to study with Psychic Medium David Merrit of Martha’s Vineyard Massachusetts. Together a core group of students participated in an in depth intensive course of study to learn the arts and skills of mediumship, claireaudience, clairevoyance, clairesentience, aura reading, claircognizance (psychic knowing) and the skills to share messages, images, and information to assist others. 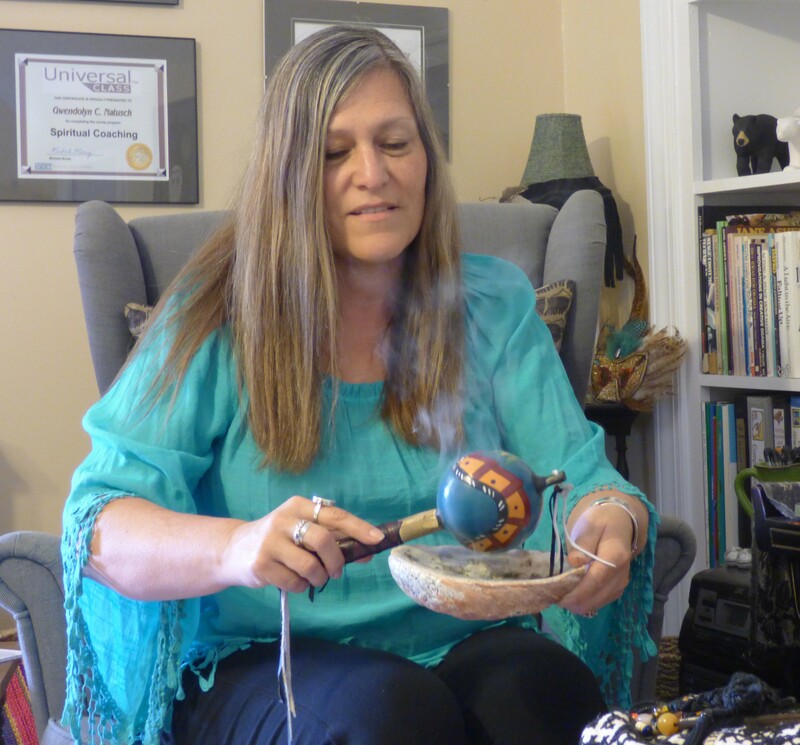 These experiences and gained skills have contributed greatly to the shamanic practice that I offer clients. Gwendolyn is an ordained minister and has a Master’s Degree in Education as well as in Social Work. 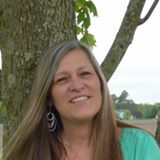 She is also a certified Shamanic Practitioner, trained Life & Spiritual Coach, a certified Past Life Regression Hypnotherapist & Life Between Lives Hypnotherapist. 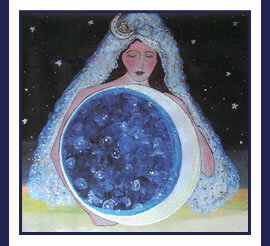 She is also a Level II Reiki Practitioner. Her work as an educator has been in the role of middle school and high school special education teacher for almost three decades working with students challenged by mild to moderate learning disabilities and students struggling through emotional and behavioral disorders. 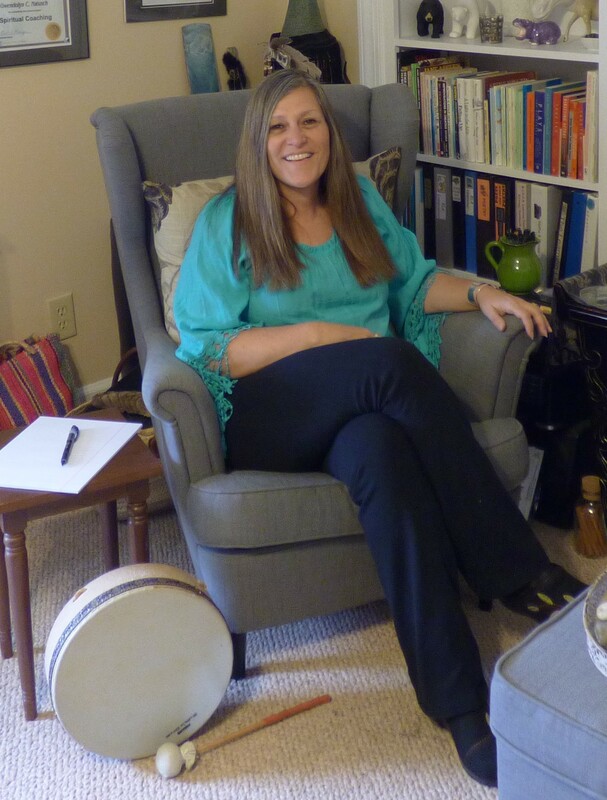 Her training and work in social work has offered her skills that contribute greatly to her ability as a Healing Practitioner and Life and Spiritual Coach. Her training in coaching has been completed through the Life Coach Institute of Orange County. 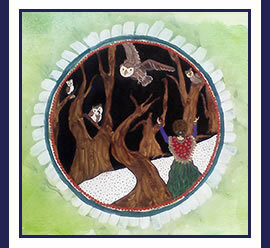 Gwendolyn is kind, present, and has found a calling deep within her to this work through her shamanic practices: Owl Medicine: A Shamanic Healing Path and The Center for Personal Evolution. 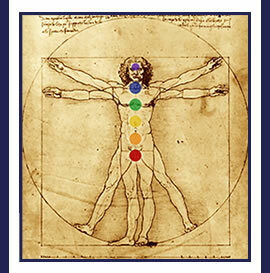 The Center for Personal Evolution’s mission is to bring a variety of experiences that promote personal growth, inquisitiveness, and creativity with the aim of building a community of like minded people through classes, retreats, workshops, and community wide events that raise money for meaningful causes that are in line with our mission as a center. We are thrilled you are inquiring about us and all that we do! At the Center for Personal Evolution (CPE) we offer a wide variety of opportunities for spiritual and personal growth that support the evolution of your inner self. Please check out our calendar for current classes, workshops and events. Our core values focus on providing classes, workshops, personal services, and community events that foster and nurture a sense of inner wisdom and resourcing. Assisting and supporting individuals to build and bolster an inner connection to their higher self, inner strengths and to the Divine (however that is valued or unfolds for an individual) is our most treasured value and motivation. Our organization values personal interactions that take shape in small groups & gatherings, and in one-on-one service delivery formats. We believe that this allows for and supports quality connections between service providers, clients and our community. CPE brings larger groups together for connection and for contributory causes.